I was shocked to see this tweet 5 mins ago! Less than 24 hours before the Union Budget 2019 (Interim), only to manage the fiscal deficit target of 3.3%. What in the world is happening? 2 Year old GDP being changed today!!! What is the sanctity of any calculations made since then? I don't understand what data to believe anymore! Govt data, Corporate Data, Institutional data - everything is fluidic and keeps changing based on the circumstances! The information says that Agriculture as a sector has grown at 6.8%! Really? if that was the case, then why is there farm distress across the country? Why are farmers on protest every third day, in some part of the country? 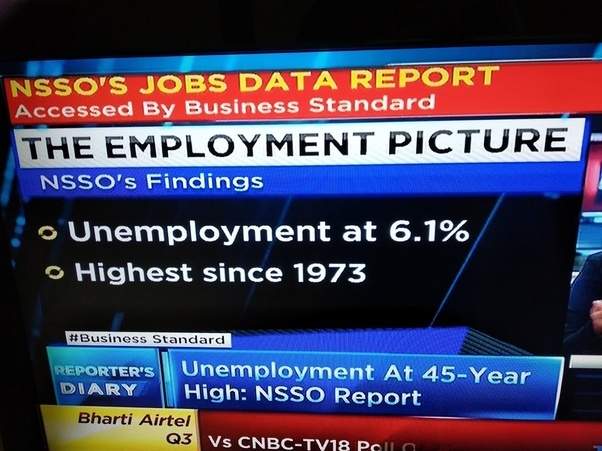 Today, at 4 pm, I saw a report that unemployment hit a 45 year high at 6.1%. This report was prepared & ready by Dec 2018 but the govt. wasn’t interested in releasing it. Hence the last two officials of the National Statistical Commission (NSC) resigned two days ago. Looks like GDP, GVA, Core Sector Data, employment, corporate financial statements - nothing can be taken at face value anymore. 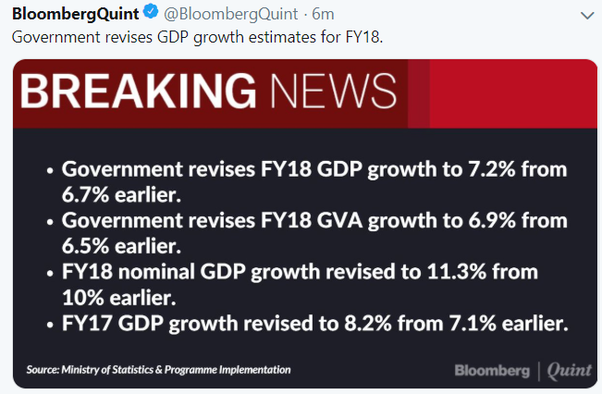 I am still surprised and unable to digest the change in GDP. Next month, we might have a new formula and a new one after the elections. Who knows? Anything is possible. Image credits: Bloomberg Quint tweet, Live Mint article, CNBC TV18 live shot by the author.